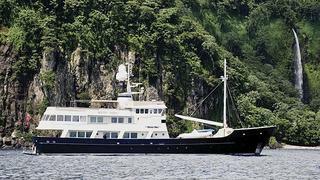 News just in from Yacht Connections of a $1.1 million price cut on the 46m expedition yacht Dione Sky. Custom built in 1996 by Palmer Johnson Yachts, she accommodates 10 guests in a master suite, two double staterooms and two twin cabins. This luxury vessel's sophisticated exterior design and engineering are the work of Vripack. Dione Sky has an impressive history of expedition cruising including the honour of being the first motor yacht to circumnavigate the North American continent, unaided, with a successful transit of the North West Passage in 2001 with her first owner and at least as far again with her present owner who has done a figure-eight passage around all North and South America – a trip for which she was awarded the prestigious Voyager’s Trophy at the 2011 World Superyacht Awards. Dione Sky has always been maintained to the highest standard and is in turn key condition. In 2007 she received a major overhaul/rebuild in the Netherlands. Her present owner has had the yacht in Derecktor’s Shipyards in Connecticut and Florida for upgrades and service. The engines were completely rebuilt in February/March 2013 along with injectors and turbos to Caterpillar 'Zero Time' specification to ensure safe and trouble free cruising for years to come. ABS classed and MCA compliant, Dione Sky is down from $20 million to $18.9 million.